Halloween is a great excuse to party – and Halloween parties are a great excuse to drink more craft beer. Thus I grabbed a bottle of Garage Project’s Day of the Dead dark lager because it seemed like a suitable beer for just such an occasion. Blurb on the bottle: Lager, but not as we know it. Garage Project’s Day of the Dead – a strong black lager inspired by the Aztec beverage xocolatl, “a bitter, frothy, spicy drink” combining cocoa and chili. Brewed with chipotle chili, refermented with organic blue agave syrup and conditioned over raw cocoa nibs with vanilla – rich and dark, Day of the Dead is smooth and drinkable with a complex mix of smoke, chocolate and restrained chili heat. A true celebration of the dark side. 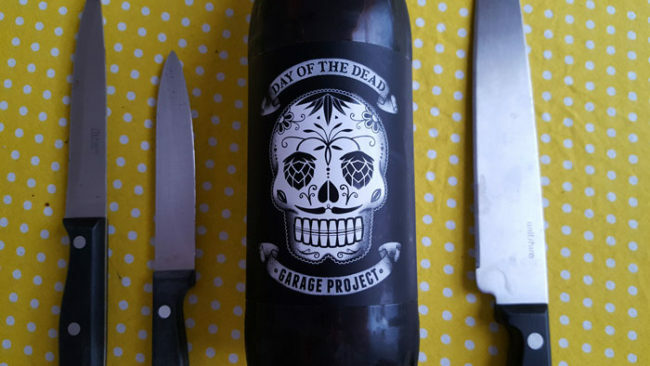 Tastes like: Garage Project’s Day of the Dead was a bad choice for my Halloween party. Not because it’s a bad beer, but because it’s so darn distracting. Every time I take a sip, I’m too overcome with dark chocolate, coffee, hints of vanilla bean and chili to follow the conversations taking place all around me. Day of the Dead is richly complex, smooth, and moderately spicy; not like any lager that I’ve ever had before. It’s mid-bodied with soft, smooth carbonation, making it one to savour and share. I love the slightly smoky finish, too, though it’s worth noting that the chili in this beer is quite moderate, subtle even. You needn’t have an asbestos mouth to handle the heat coming off this beer. The verdict: Leatherface from The Texas Chain Saw Massacre approves of this beer – or I did when I was dressed up kind of like him for Halloween, anyway. It’s refined, silky smooth, and remarkably well balanced, elevating it from just another experimental craft beer to one that I’d highly recommend. Beer/movie pairing: The beer is probably better than the movie, but there’s still a lot to love about George Romero’s Day of the Dead (1985), a zombie movie in which the humans, not the slow-moving animated corpses, are the true villains.